Up until this point, many have talked about social fundraising like a current trend or additional channel. Like you can simply add it to your marketing mix. But that definition seems to miss a larger, monumental shift that has occurred. Social media, in its relatively short existence, has fundamentally changed the way we interact with each other. It’s a dramatic transformation of how we engage with causes, and it’s never going back. It’s pretty interesting to think about just how young social media really is. Facebook was founded in 2004; YouTube in 2006. Each of these social networks is just a little over a decade old – and yet the impact they’ve had on our lives is stunning. To put it in perspective, the telephone has been widely accessible in the United States for well over 120 years. It’s almost impossible to picture how we interacted before the lens of social media existed; how we marketed, shared stories, and informed individuals about important and pressing issues in the world. This kind of swift, all-encompassing change shouldn’t be taken for granted. People don’t view the world in the same way anymore. Things have changed forever, and we all need to adapt to this shift. Social fundraising is how your supporters want to engage with your cause, make it their own, and show the world how they give back. It’s a complicated interaction of the ‘who’ (your supporter), the ‘what’ (their support of your organization) and the ‘why’ (their passion for your mission). It hinges on the ability for your community to tell the world your story through the lens of their story, all at the speed of a tap, and through the megaphone of their mobile device. This sharing and repurposing of traditional cause narratives is important and it brings a tremendous amount of value to nonprofits. An action or message delivered to you by a friend or family member resonates in ways a direct communication from an organization never could. And, thanks to the aforementioned shift, we’re now trained to digest, consider action, and spread the word. At GoFundMe and CrowdRise we’ve been seeing for some time, that fairly often, the sharing of a donation results in a new donation by someone outside the normal reach of the nonprofit. It’s really inspiring to see so many causes and nonprofits embracing this shift. They’re incorporating social fundraising into everything they do and they’re seeing unprecedented engagement. These organizations go beyond speaking ‘one-to-many’ and encourage and empower their supporters to make a cause story uniquely theirs. Then they watch as their communities bring their friends and family into the fold to share, give, and rally. Since we now live in a world that has moved ‘beyond the donation’ our focus needs to be on providing the experience that supporters of causes seek. At the moment it’s creating and optimizing the sharing experiences at specific moments of user interaction. In the near future, nonprofit success will mean engaging your community not only as donors, participants, and subscribers…but as storytellers, influencers, and recruiters. As always, there will be those that embrace the shift and those that resist it. I believe those that embrace this change will come out as the clear winners, and those that resist will find it very difficult to stay relevant. Win or lose, it’s a tremendously interesting time and I couldn’t be more excited about it all. Crowdfunding is exploding in popularity in both the for-profit and non-profit space. According to a Massolution report, the crowdfunding industry is doubling, or more, every year and will far surpass the yearly average of $30 billion raised from venture capital by the end of 2016. 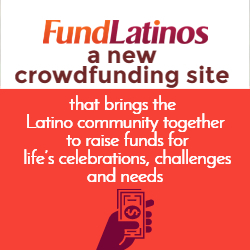 Currently, the most successful campaign of all time on crowdfunding platform GoFundMe supports the victims of the Pulse nightclub shooting and their families. So far, more than $7 million has been raised for Equality Florida, the largest civil rights organization dedicated to securing full equality for Florida’s LGBT community. Crowdfunding allowed the organization to quickly solicit donations and get much-needed help to the victims of this tragedy. Funding could have been secured in other ways, but crowdfunding allowed the organization to drastically increase their donor base and likely took significantly less time, manpower and money than more traditional forms of fundraising. The campaign also garnered more than 239,000 social media shares, increasing the reach of the nonprofit’s message. The first step in any successful crowdfunding campaign is to outline what the specific cause is, why it’s important and where the money will be going. Be completely transparent and get specific (i.e. $30 will fund a child’s education for one month). 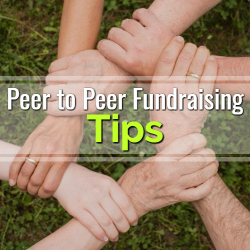 Include details about your nonprofit, its history and the results of past fundraising campaigns as well. Laws regulating crowdfunding and other fundraising efforts vary by state. Skip the state registration process allowing your organization to solicit donations, and your organization can be hit with civil or even criminal penalties. Soliciting donations from multiple states? You might be subject to the jurisdiction of all of them. 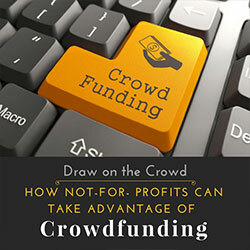 The specific regulations surrounding crowdfunding are debated, but the Charleston Principles written by the National Association of State Charity Officials (NASCO) can help provide some guidance. Your tax professional should also be able to provide valuable counsel. Potential donors who are not already familiar with your organization or cause are much more likely to contribute if the crowdfunding campaign already has strong traction. Before promoting the campaign with the public, reach out to current and past donors who can start to build momentum. Ideally, 30 percent of your crowdfunding goal will already have been reached before your campaign even goes public. This builds credibility for your campaign from the start and helps to nurture your relationship with your donor base. No matter how noble a cause may seem, donations made through crowdfunding are only tax deductible if they are made to a 501(c)(3) organization under the IRS tax code. Emphasize that your nonprofit has this designation and explain the tax implications to prospective donors to give you a leg up over requests from individuals, for-profit organizations and entities that aren’t designated as qualified charitable organizations. Any questions on this aspect should be addressed by your CPA. You can also incentivize corporations to participate in your crowdfunding campaign with a matching gift program. Giving companies the option to match any individual gifts received through a crowdfunding campaign gives them additional exposure and builds excitement around their contribution. Matching campaigns also can encourage a surge of donations from individuals who see that each dollar they donate will go much further. In lieu of a monetary donation, companies can also get involved by providing in-kind gifts for various levels of individual giving. Just as you should with traditional donations, every single person who contributes through a crowdfunding platform should be thanked. This can be a daunting task for viral campaigns, but by keeping proper records, it is doable and invaluable for building relationships with future potential donors. Show gratitude and make it clear exactly where their money is going. Many campaigns offer tiered rewards for donating above certain thresholds, which furthers goodwill with new and existing donors. When asking for larger donations from corporations, decision makers may need more convincing than your typical pitch. Competition among nonprofits for corporate sponsors is fierce, and a history of successful crowdfunding campaigns can help you prove that your cause has a strong support base. Take the time to build and follow through with a solid strategy for your organization’s crowdfunding campaign, and it can become an important tool for soliciting donations on a large scale. 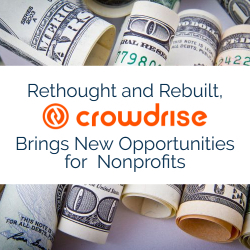 In the past few years, many nonprofit organizations have turned to crowdfunding sites to increase their fundraising efforts. Yet what is rarely discussed is that for nonprofits, conventional crowdfunding can actually backfire. Everyone is inundated with daily requests to make donations to a worthy causes that may or may not directly impact them personally or would be a cause they would be willing to support. Simply casting a wide net and sourcing an ambivalent, large crowd of people asking for donations to an organization they may have never heard of or are not aligned with their own personal beliefs or interests, could potentially cause damage to the organizations reputation, and will certainly do little, if anything, to secure donations. Why? 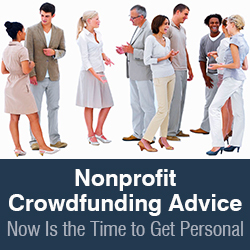 There is nothing “personal” about conventional crowdfunding. What does work? Using a circle-giving approach. How does circle giving work? Everyone runs in different circles – home, work, school, church, civic, recreational. etc. When they intersect, the center represents an opportunity for circle giving – to inspire individuals to then share information to their own related networks. Circle giving relies on first connecting with the people who already exist within an organization’s core circle – family, friends, board members, past donors – and then allowing the outreach to grow organically through these key influencers who already believe in your organizations cause. These are the people that are likely to be more than willing to help reach out to people within their own individual giving circle, or share through world of mouth. 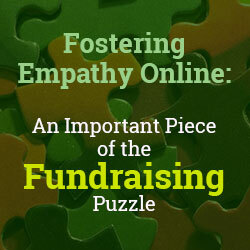 The most powerful fundraising campaigns are the ones that create a personal and emotional connection with potential donors, particularly in an online context. A personal connection results in a much higher likelihood of giving. 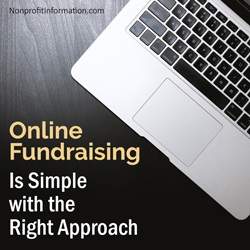 While donations are an integral part of online giving, sharing the fundraiser itself is much more important since it typically leads to more donating. You can think of these circles as a Venn diagram. Sharing a compelling story in a personal way propels a tight inner circle giving campaign to the next outer circle of friends of friends, and the potential for even more sharing to the next circle, and so on. Now that we’ve established the importance of circles, it’s imperative to know how to activate those circles with your online campaign. Make it personal: A campaign needs to have a face (or faces). There needs to be a person or group of people, who will be impacted by the giving. Their stories should come alive in the course of the campaign. Make it specific: It’s all about the story. Circle giving works best when there is a clear, relatable result for the money donated. A fundraising goal should be something tangible, so that donors have confidence that their donations will have a real impact. Make it achievable: The average gift for nonprofits is around $75. In relative terms, it’s small dollar donors who will make the funding goal happen. Be aware of the potential of your circles and pick a goal that feels attainable, especially on your first foray. Show, don’t tell: Videos work. Not the slick, over-produced ones – but the ones created by the faces of your campaign or about the people you help. It’s all about authenticity. Content is what will drive sharing, so ask yourself, “Is it share-worthy?” about any content you develop. Prime the pump: Just like at fundraising events, make sure you have some people lined up to donate in the first few days to gain momentum early on. Also, matching gift challenges can help to bring high dollar donations (i.e. “if you donate $500 in the next two days, I will match it”). People like to feel like they are part of something successful and important. Crowds may surge, but they then disperse. Circles grow steadily, and stay. 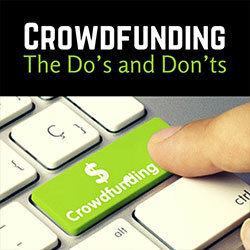 When you’re thinking about how to make crowdfunding work for you, step away from the crowd and step into your circles.